"I believe a leaf of grass is no less than the journey work of the stars"
I am originally from Missouri. It is so green there. I moved to California when I was a child. My memories are of rolling green hills, thunderstorms, fireflies, and icicles. I've always loved being outside. The peace that this earth has to offer has always called to me, asking me to sit and be still. I find my greatest pleasure among the beauty that this earth has to offer. The wildlife, the wide open fields, the funky flower that buds atop a weed, it is all beauty. 90% of the flowers I use are grown in San Luis Obispo County and along the central coast of California. We are proud flower frog enthusiast and have a wide variety of vessels for use at your event. 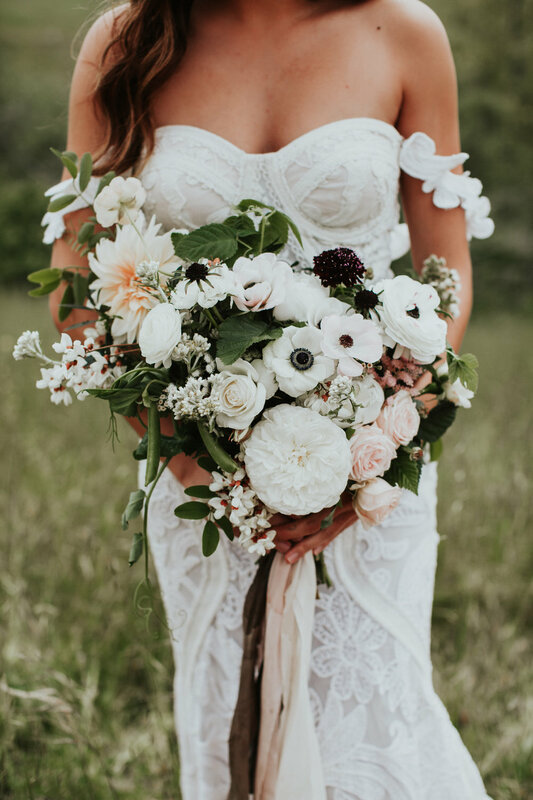 I gravitate towards the romantic and whimsical, old world and heirloom blooms and wild natural greens. "I was blown away by how beautiful they were! You are truly an artist and we were so lucky to have you involved in our special day"
Women have forever been crowned in flowers to express their beauty. It is also one of my favorite things to do. Featured on "Wedding Chicks" "Style Me Pretty" "Green Wedding Shoes" "Santa Barbara Life & Style" "Boho Bride" "Thistle Magazine" "Sweet Violet Bride" "Rubies and Ribbons"